President Obama yesterday (15th February 2012) visited Master Lock’s Milwaukee manufacturing plant, for a tour of the hi-tech manufacturing facilities and to praise the company on in-sourcing jobs back to the United States from China. 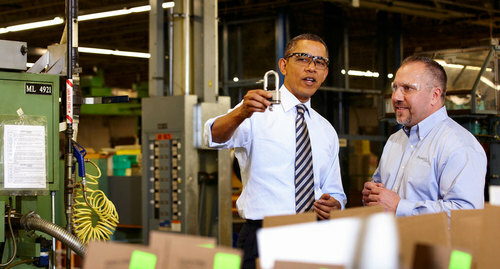 During his remarks, President Obama acknowledged Master Lock for “making the most of a huge opportunity” to bring manufacturing jobs back to America and cited the company as “a proud example of what can happen.” Since mid-2010, Master Lock has brought back approximately 100 jobs to its Milwaukee factory. Master Lock’s decision to bring jobs back to the U.S. was partially motivated by economic reasons related to increasingly higher labour and logistics costs in Asia, and further, ongoing labour availability challenges especially in the coastal areas of China. Advantages of moving the jobs include a more competitive overall cost structure, greater control and the ability to provide better service to customers. According to Master Lock CEO, John Heppner, the company would like to bring more jobs back from overseas should the underlying economics support the move. Master Lock is the world's largest manufacturer of padlocks and related security products providing innovative security solutions for home, automotive, campus, power sports, bike and storage security needs for consumers and contractors alike. Master Lock Company is an operating unit of Fortune Brands Home & Security, Inc. This press release was distributed by ResponseSource Press Release Wire on behalf of Kiss Communications in the following categories: Business & Finance, Manufacturing, Engineering & Energy, Construction & Property, for more information visit https://pressreleasewire.responsesource.com/about.